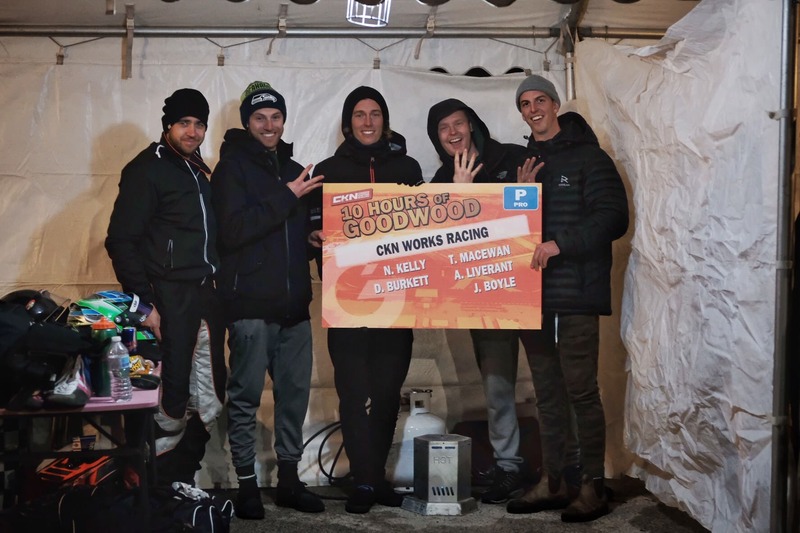 CKN Driver Blog: 10 Grueling Hours of Goodwood by Nathan Kelly – CKN | CanadianKartingNews.com | Because Karting is a way of Life! With the Canadian race season ending, I had pretty much prepared to put my helmet on the shelf for the season. However, a phone call and some last minute efforts gave a chance to squeeze one last race in before the snow hit…or so I thought. Here is a breakdown of my race weekend at the 10 hours of Goodwood. Last Thursday I got a text from Cody Schindel asking if I would be free on Sunday. Anytime someone from the racing community asks about your availability for a Sunday it is a safe bet it involves a race track. He was looking to submit a team for the 10hours of Goodwood, the first race of its kind held at Goodwood Kartways in Stouffville, Ontario. We needed a team of 4 people and had less than a day to put the team together. I immediately began going through my contacts and picking a roster. Most drivers, however, were already on a team or had previous engagements for the weekend. My first response came from Danny Burkett, who responded within 20 seconds with a “100% in”. I explained to Danny the situation and we both began the hunt for our team. We were able to pull in two more drivers within the hour, Aleki Liverant and Tyler McEwan. This rounded out our team quite well with the additional two drivers having some great karting experience. I had posted to Instagram that we were looking for drivers in hopes of speeding up the process. About fifteen minutes after posting I got a call from a good friend named Joel Boyle. Joel is a huge F1 fan, lives in Toronto and we both share the same hometown. With zero racing experience, this seemed like the perfect time to bring someone new into the sport. Joel was on board and the team was set. McEwan was the only driver who was able to make it out for Saturday qualification. This also meant that he was the only driver that would get the breakdown of rules, formatting and instruction. He was able to put us in third place in Qualifying for the start of the race. A huge thanks to him for working the entire day by himself to make that happen. Even though we were all at work, we were all also in communication to figure out where we would be starting for race day. Weather conditions for Sunday were not great, with snow in the forecast it was less than ideal conditions to race. It was an early start at 6:45 am to drive from Toronto to Goodwood. It’s always fun to be with someone when they are trying something new for the first time; this was case driving to the track with Joel. As we got closer to the track it was snowing quite heavily. Not the best conditions to learn to drive in, however, he was enthusiastic about it. We got to the snow-covered track and the entire team began to arrive. There is something special about meeting up with people at the racetrack. It is like this entire aspect of your life that goes on pause when you leave the track and immediately starts again when you arrive. Familiar faces were everywhere. After catching up with people, we were given our kart. Goodwood Kartways had provided a brand-new chassis and motor for all competitors which was quite well set up. Overall, the structure and effort put into the event was quite impressive. Standing around our small space heater we discussed what the order of our drivers would be. McEwan would start us off and was able to put us up into second place after his one-hour drive. I would be up next and was able to hold that second place position for us for the following 50 minutes. Next, we had Danny in the kart, our pit stop strategy was to run the kart for as long as possible with minimal stops. Danny showed a fantastic drive and moved us up into first place. 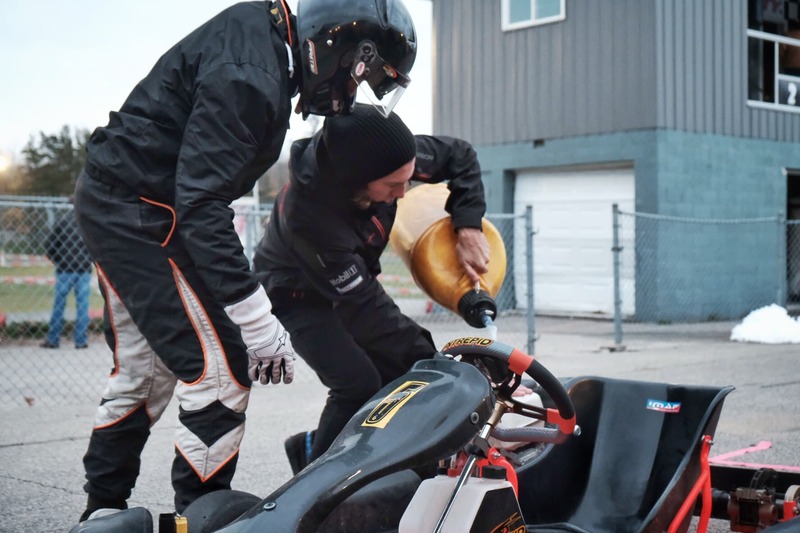 It was then Joel’s turn to jump in; we had spent some time teaching him the basics, but jumping in and racing on a wet, cold, snow-covered track is never easy, even for an experienced karter. He did quite well, keeping the kart on track and driving in the wet on slick tires. We made our final switch in the rotation putting Aleki in and he was able to put in some consistent lap times. McEwan went out for his second stint and immediately we were faced with a mechanic issue of a stuck throttle. He was able to recover after going quite far off the track into the snow. After bringing the car back into the pits, we realized that the throttle adjustment bolt had become locked under the floorplan. While trying to fix this we lost a decent amount of time and found ourselves in sixth. Our team managed to battle back and round out the day with a respectable fourth place finish. It should be noted that Boyle was able to drop his lap times to within two seconds of the pace. Very respectable for his first day of racing. Burkett, Liverant and McEwan all had strong consistent drives throughout the entire 10 hours which paid off well enough for a top-5 finish. Not too bad for a group of guys who have not raced consistently for a couple of years. Overall it was an exceptionally well-run event by the staff of Goodwood. The karts lasted a full 10 hours of racing with minimal wear and tear. As a team, we are already looking to return next year!